The size of the furniture and the choice of color has an effect on how your living space would look like. 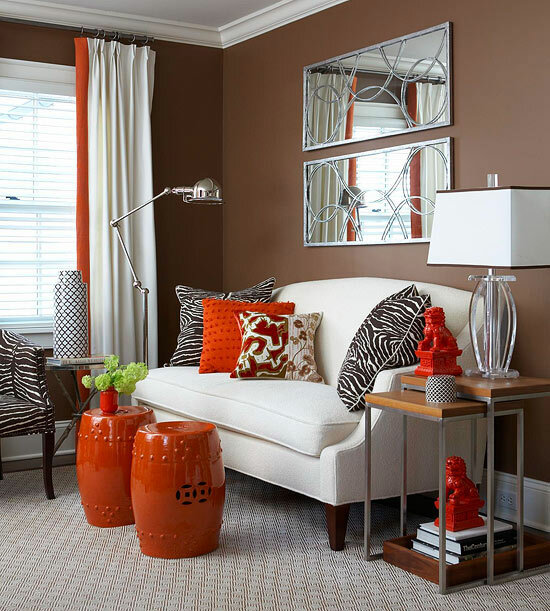 It is important for us to create an illusion of a big space by adding mirrors on the walls and choose the right colors that we could mix and match to create an overall impact. The Living Room design, as shown above made use of the appropriate size of furniture like the side tables and bright colored garden stools that were transformed into an instant coffee table. The relatively small size of the furniture has made it possible to move those pieces to any part of the house, so if you are just renting an apartment or a condo unit, it would be easy to pack up your things once you've decided to move into another area. I love the garden stools. Such a quaint style! The right arrangement can make all the difference especially in small spaces. i love that design, so cozy and so neat, makes me wonder why I am her ein front of computer, I should be tweaking our living room and house now, haha!! The mirrors actually create an illusion that the space is bigger than its actual size. I have a current challenge to rearrage my office room but I cannot do much because I'm using old furniture. Duh! OMG! That is an awesome interior. I like the color combination, very modern. This is an awesome interior. I like the choice of color combination. Size doesn't matter if one knows how to place in order. I love the wall shades. This is a great article for those condo owners who have limited space to work with in terms of designs. Go for less bulky furniture in light color and paint the wall with light colored paints as well to make the room look big. Install floor length mirrors for added dimension. I love the design and the color of the living room.Wish to have one in my living room now. Great points! I love watching home features about small spaces, those furniture that turns to another by day and which makes living in limited space more convenient. That is a lovely and neat space. I also want to incorporate bright colors in my living room. It made me more relax.